Apple's digital wallet collects our credit card numbers and charges without us taking out a wallet. It's just not everywhere yet. Apple Pay is as easy as apple pie. In fact, that's exactly the first thing I paid for when installing the digital wallet on my iPhone. Waiting in line at McDonald's, I had my hands full with my smartphone, car keys I hadn't put away yet and sunglasses I just had to take off indoors - I'm not that much of a badass. For the first time since my parents bought me McDonald's Happy Meals as a kid, I didn't have to take out my wallet. It remained firmly in my back pocket. Apple Pay and my Touch ID fingerprint handled the transaction on my end, while an NFC base station accepted the contactless payment on behalf of McDonald's. Apple Pay requires iOS 8.1 or above and owning an iPhone 6S, iPhone 6S Plus, iPhone 6 or iPhone 6 Plus. The iPad Air 2, iPad mini 4, iPad Pro, iPad mini 3 and Apple Watch also work with it, but the iPads only support it in apps and the Apple Watch needs to be paired with an iPhone. Yes, the iPhone 5S has the same sapphire-coated Touch ID button as the newer iPhones, but it doesn't have the near field communication antenna that's necessary to pull off the transaction. Tucked away in Passbook (which has since been renamed Wallet in iOS 9) is Apple Pay along with the ability to add new credit, debit cards and since the change in name even gift and loyalty cards. I could have manually entered my card number and expiration date, but in this fast-food workaday world, that's not the easiest option. Instead, tapping the camera icon opened up the camera app so that I could snap a photo of my card. It automatically filled in the card numbers and expiration date - all I had to do was punch in the security code on the back and agree to Apple's lengthy terms of service. It worked flawlessly for four out of five of my card capturing attempts, picking up the wrong expiration date once. Manually overriding this error was rather easy. The numbers were verified and it logged the credit card into the Wallet app within seconds. A graphic representation of my cards appeared within the Wallet app showing the last four digits, but like a proximity-sensing Wallet flight reservation, I never had to dig into this menu again. Simply waving my iPhone above the McDonald's NFC reader surfaced my lead credit card. It popped up "magically," as Apple always likes to say. This form of sorcery isn't new at all thanks to the years-old Google Wallet and Windows Phone 8 Wallet apps. In fact, Apple Pay uses the same base station for transactions, a huge plus for cutting-edge stores already equipped with NFC readers. The instructions asked me to put my fingerprint on the Touch ID sensor that doubles as the iPhone 6 home button and doing so completed the purchase. No pen, no paper and no plastic credit card required. Only an all-metal aluminum iPhone 6. 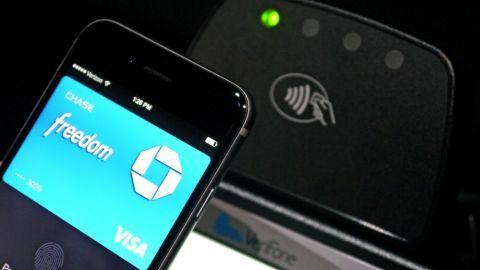 What's unique about Apple Pay is its integration with the Touch ID sensor. Your fingerprint is now the signature that completes the transaction. And unlike your autograph, the biometric fingerprint can't be forged. Apple Pay also listed my most recent purchases, but doesn't store all transaction information, instead referring me to my issuing bank for more details. That's so charges can't be tied back to me. It also never revealed my name, card number or security code to the in-store cashier. ID checks aren't required either thanks to Touch ID.